The tale of “Sidventures,” a photo book that doubles as a children’s story, starts here in Omaha, on a frigid December day in Dundee. Alex Hopes was just hanging out at home when he got a phone call that would eventually alter his life. He told The Reader about it in an email interview from his home in Austin, Texas, where he now makes a living as a photographer. But Hopes was curious and looking for a reason to get out of the house. So, he headed to South Omaha to take a look at the pup. He said he believes winter in Omaha has the ability to make people do crazy things, which is how he ended up with his “little ball of cute,” a six-week-old beagle mix he eventually named Sid. Training began shortly thereafter. Though he was going to school and working, Hopes said he had plenty of time to devote to the task. Because he’d never had a dog before, he found the work exciting. While he enjoyed the work, that doesn’t mean it was easy. He said potty-training a small dog in the winter was especially tough. But the groundwork Hopes laid down during this training would eventually lead to Sid’s internet fame and his own book. Hopes had heard other dog owners complain about getting into the trash, so he knew right away that he didn’t want Sid doing this. “I began setting traps for him. He knew he wasn’t allowed in the kitchen, even though he went in there every time I would leave the house, so I had to teach him to stay out. These photos are all over Sid’s Instagram account. Hopes said Sid was about a year old when Instagram started becoming popular and his own account quickly became largely about Sid. He said he started feeling guilty about his “gratuitous Sid posts.” So he made him his own, @myregalbeagle. But the pup’s internet fame didn’t really start to pick up until shortly after the two moved to Austin. Hopes said it was a month-long series of Sid in sunglasses that really kick-started his popularity. He remembers the first time he realized just how popular his dog had become. The truest testament to how popular he had become happened just over a year ago, when Sid was hit by a car. The prognosis wasn’t good. It was highly likely he would need surgery on his diaphragm. He had four broken ribs and he had to have his spleen removed. Shortly after the accident, Hopes posted the sad news on Instagram to let Sid’s fans know. In his podcast, “Mostly Sid,” he said the incredible amount of support he received was overwhelming. He credits Sid’s almost miraculous recovery to the outpouring of good will from his fans. People sent gifts to both Hopes and Sid and set up donation accounts for his vet bills. It was only 21 days later that Sid was considered fully recovered, regaining the weight he’d lost and going to play in the park. The course of their lives had been changed. Before the accident, Hopes had been planning to move to Croatia with some friends, taking Sid with him. But now deadlines had passed and Sid probably wouldn’t be able to go. With no place to live and very few possessions, Hopes decided they would hit the road. They went to the West Coast, up to Canada, and down through Omaha on their way back to Austin. Along the way, Hopes took photos of all the places they went, many of them featuring Sid, of course. And that’s the story of how Sidventures came to be. Hopes said he didn’t want to just post all the photos on social media. The story behind them are too important. He wanted them to have more of an impact. So, now you can get the book and see all of Sid’s adventures. Plus, there’s a story to go along with them. And it’s a happy one. 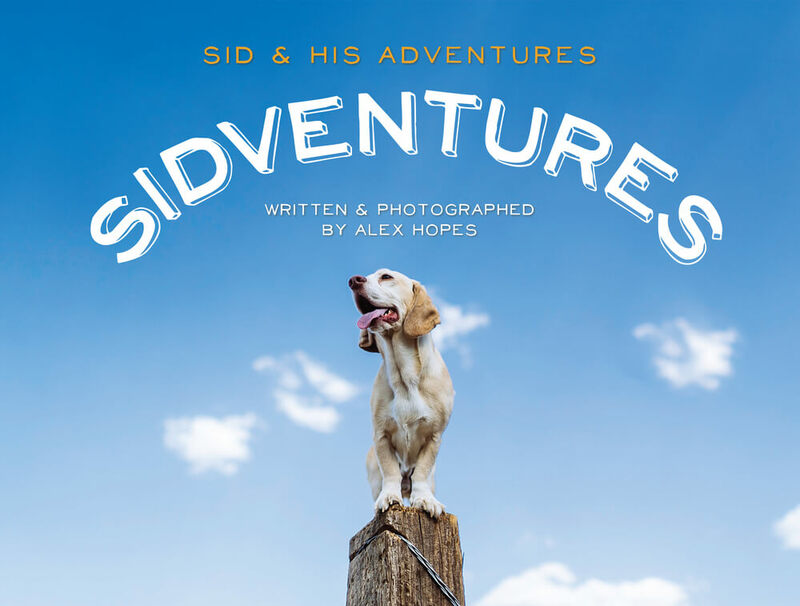 The book is available for purchase at www.myregalbeagle.com or www.alexhopes.com/sidventuresthebook. You can even have Sid sign it for you. A pawtograph, if you will.